With a pair of feature-rich, high-performance and scalable power-management ICs (PMICs) from Maxim Integrated Products designers of mobile systems can now maximize performance per watt while increasing system efficiency for computationally intensive deep-learning systems on chip (SoCs), FPGAs and application processors. The MAX77714 and MAX77752 address a broad spectrum of applications ranging from augmented reality/virtual reality (AR/VR), gaming, solid-state drives (SSDs), security and industrial internet of things (IoT) to handheld devices such as cameras and home automation hubs. Architected to deliver numerous benefits, including consuming 40 percent less power than standard solutions, the PMICs extend battery life while providing the most compact form factor in the market. 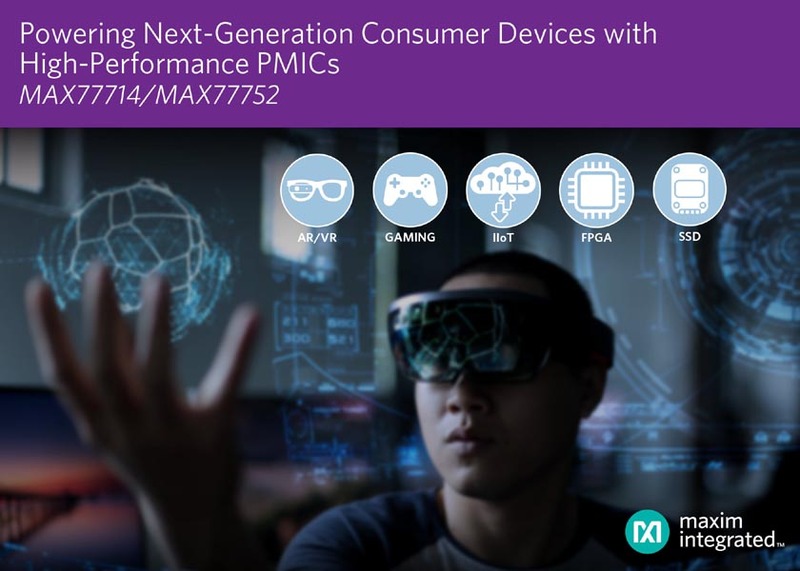 The MAX77714 PMIC delivers a complete, efficient power-management solution in a compact package to enable multi-core processor-based systems to operate at maximum performance with greater than 90 percent efficiency at 3.6 VIN, 1.1 VOUT. With a 70-bump, 4.1 mm × 3.25 mm × 0.7 mm WLP package, it enables thinner, smaller devices and extends battery life up to 40 percent compared to stand-alone solutions. It reduces design cycle time, component count and bill of material (BOM) costs compared to discrete solutions by integrating 13 regulators, including 9 low-dropout linear regulators, real-time clock (RTC), backup battery charger, watchdog timer, flexible power sequencing and 8 general-purpose input/outputs (GPIOs). MAX77714 Efficiency vs. Load Current SD1 (VOUT = 1.5 V). 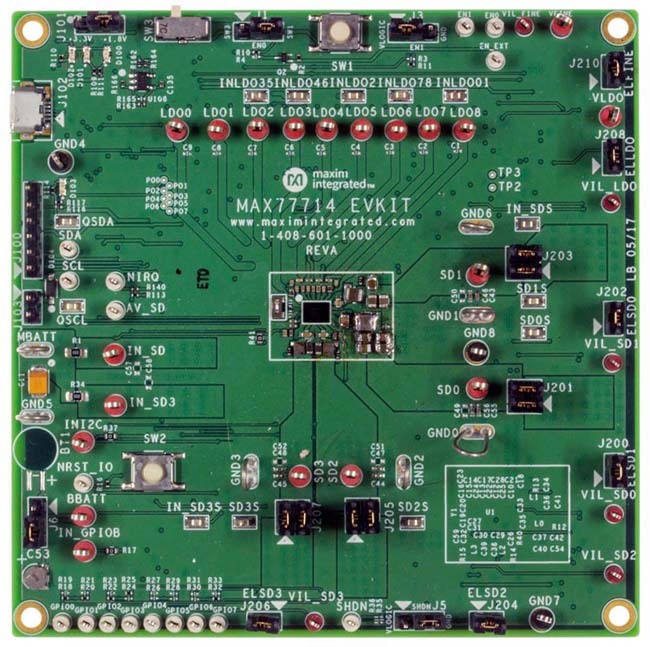 The MAX77752 is a multi-channel, compact and integrated PMIC designed for applications with multiple power rails and hot-plugging capabilities. It improves efficiency up to 90 percent at 3.6 VIN 1.8 VOUT for longer battery life and includes a flexible power sequencer (FPS) to allow hardware- or software-controlled power up. It reduces design cycle time, component count and BOM costs by integrating three buck regulators (with high-accuracy brownout comparators), one low-dropout linear regulator, two dedicated load switch controllers, one in-rush current limiter, two external regulators to enable outputs, voltage monitor for backup power control and a dedicated digital output resource for logic control. The MAX77752 comes in a compact 40-pin, 5 mm × 5 mm × 0.8 mm, 0.4 mm-pitch TQFN package. The MAX77714 is available for $2.75 (1000-up, FOB USA); the MAX77752 is available for $1.40 (1000-up, FOB USA); Both are available at Maxim’s website and with select authorized distributors. The MAX77714EVKIT# evaluation kit is available for $80; the MAX77752EVKIT# evaluation kit is available for $100.